You’ll find the BMW Car Club of America (BMW CCA) a great family organization which will help you get more enjoyment out of your BMW while making new friends along the way. 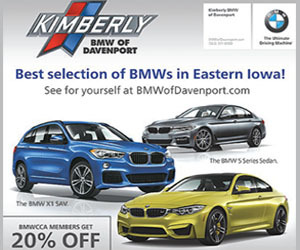 Becoming a member of BMW CCA automatically makes you an Iowa Chapter Member. There are no additional dues to pay for your membership in the Iowa Chapter. Free classified advertising in Roundel, and the chapter website plus many other benefits! Chapter events throughout the year. New friends with a variety of interests including, of course, BMWs! Former or lapsed members please call the National Office at (800) 878-9292 to reinstate your original membership number. To report address changes, please call National office at (800) 878-9292 or visit BMW CCA website. You will have to login to change your information. If you haven’t created a login lately you will need to do that before performing any of the membership services. You should then be able to change your address, add your cars into the database and renew your membership using a credit card. Information updated with the National Office is forwarded to local chapters by National so there is no need to notify us separately of your changes. We welcome and invite you to attend the many events we hold for YOU! We have a lot to offer and look forward to getting to know you.